With the Buffalo Braves coming off their bleakest season since 1972-73, job number one was to improve the morale of the franchise. Toward that goal, the Braves made a couple of hires that added people who could only be considered raging optimists. Norm Sonju came out of absolutely nowhere. He had been working for ServiceMaster Industries – a contract cleaning service -- when he was named president and general manager of the Braves. It could be argued that the team needed some cleaning up, but that didn’t make his appointment at all expected. Sonju’s only connection with sports was through the Fellowship of Christian Athletes and Baseball Chapel. Sonju was a whirlwind upon arriving, talking to everyone and anyone about the future of the team. "Let’s face it, the Braves’ organization has made some mistakes in the past, but we intend to right all the wrongs," Sonju said at the time. Reporter Milt Northrop of the Buffalo Evening News thought Sonju tried to do too much when he came to Buffalo. “He used to sit in his office until 10 or 11 at night, personally answering letters,” he said. “You know the number of crank letters you get. Some people write and make a valid point, while others say something that’s out in left field. Well, he answered every one of them personally. He could have written some kind of form letter." Cotton Fitzsimmons wasn’t quite as talkative as Sonju, but he knew his way around the NBA. He had been a coach in Phoenix and Atlanta, and was well regarded around the league. Fitzsimmons had been the director of player personnel for the Golden State Warriors in 1976-77, and he was happy for the chance to coach again. He signed a four-year deal on Aug. 5. Fitzsimmons, too, was known being upbeat. His personal motto was "You're not going to make me have a bad day." Some optimism was needed, because there certainly wasn’t much in the community at the time. In his book “Ice to the Eskimos,” Jon Spoelstra writes about how he was named vice president of marketing for the Braves in the summer of 1977. He was told that the Braves had about 5,000 season tickets for the upcoming season. Spoelstra writes that, in fact, the Braves lied. The actual number of season tickets in August was 50. Five-oh. “We sold about 3,000 season tickets (actually, closer to 2,500) in an impossible situation using the embryonic principles of jump-start marketing,” Spoelstra writes. The team obviously was in need of a complete makeover for the upcoming season. Brown started on draft day, when he was in possession of the third pick in the draft. He called the Milwaukee Bucks and talked to owner Jim Fitzgerald and general manager Wayne Embry. According to Embry’s book, “The Inside Game,” Brown told them that he wanted to change the, um, complexion of the team. “I need a white center,” Brown said. Let’s think about this one for a second, going beyond the obvious ignorance involved. Who was the best player in Braves’ history? What player's departure had fans running away from the turnstiles? Bob McAdoo, an African-American center, both times. Milwaukee not only had a center who passed Brown’s test, but he was available. The Bucks figured to take Kent Benson with the first pick in the upcoming draft, so Swen Nater was expendable. "Have we got a guy for you," Embry told Brown. The Bucks traded Nater and the 13th pick in the first round to the Braves for the third pick in the draft, and used it on Marques Johnson of UCLA. The Braves had hopes of taking Cedric Maxwell at number 13, but Boston took him at 12. Disappointed, Buffalo sent its new first-round pick to Chicago for a second-round pick (Kentucky guard Larry Johnson) and $125,000. None of the other Buffalo picks played in the NBA, and Johnson added little to the Braves. The last pick of that first round, Norm Nixon, became a starter on some championship teams in Los Angeles. Brad Davis and Rickey Green also went late in the first round. Think one of them could have helped? •Sept. 1 – Adrian Dantley and Mike Bantom (signed that day as a free agent) to Indiana for Billy Knight. •Sept. 1 – George Johnson and a first-round draft choice to New Jersey for Nate Archibald. •Sept. 2 – John Gianelli and cash to Milwaukee for a first-round pick. •Sept. 7 – Ernie DiGregorio to Los Angeles for financial considerations. •Sept. 9 – A third-round draft choice to Atlanta for Bill Willoughby. Whew. 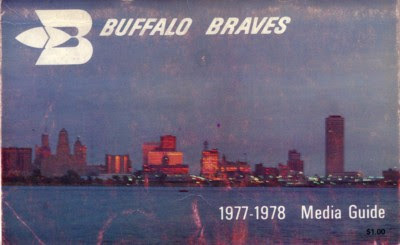 No wonder the media guide had a picture of the Buffalo skyline instead of a specific player or two on the cover. What did the revised roster look like? Nater was the starting center, backed up by free agent Jim McDaniels. Knight and John Shumate were the starting forwards, with Willoughby and Gus Gerard as reserves. At guard, Archibald and Randy Smith figured to be a dynamic backcourt, with Chuck Williams on the bench. They added forward Wil Jones and guard Ted McClain as free agents during training camp, sending draft choices to Indiana and Denver respectively. So the Braves would be different in 1977-78. But would they be better? As of the start of training camp, that was hard to tell. Knight was at the peak of his career, coming off a 26.6 points per game average the previous season. Of course, Dantley was good too. "I was kind of shocked that they traded me, but after finding out about John Y. Brown's background I really wasn't upset at all," Dantley said later. "I knew he wanted some ABA players." Shumate was back. Nater figured to be an upgrade at center over what was around the previous year. Smith was ready for the best year statistically of his career. Archibald had been one of the league’s leaders in points and assists for several seasons, and was only 29. That was a good starting lineup, but there certainly wasn’t much depth. All of that movement left little time to pause to consider the end of DiGregorio’s time in Buffalo. The point guard certainly needed a fresh start in 1977, but he never came close to getting his career on track in Los Angeles and Boston in 1977-78, and was done at the end of the year. Ernie D had overcome some long odds to reach the NBA and had provided plenty of thrills in Buffalo. It was too bad he had to leave with the proverbial whimper instead of a bang. Western New York’s look at DiGregorio’s replacement at point guard didn’t last long. In fact, those who didn’t show up for an exhibition game against Detroit in the Aud missed Archibald’s career in Buffalo. He tore his Achilles tendon and was out for the season. "There was a picture of me standing right over Tiny. I happened to be sitting in the end zone, 10 feet from where that happened when he landed on (Bob) Lanier's foot, 48 hours before our first game," Sonju said. "I can honestly say that I, more than any other person in that arena, knew what that meant. Our whole offense was geared to Tiny holding the ball. ... He truly was a great player. With him handling the ball, dishing off the ball to Randy Smith and Swen Nater, a big strong center, there was a chance that the team could have been good enough to make the last playoff spot." The injury ruined the 1977-78 season before it even started. Not that many could replace Archibald, but a thin team couldn’t afford that sort of loss. Buffalo got off to a decent start that season despite the lack of a point guard. Buffalo settled in around .500 for most of the month of November. The team was 9-9 on Nov. 23 when the Braves made one last swing for the fences. They sent Shumate, Gerard and a draft choice to Detroit for Marvin Barnes and draft choices. On a franchise that had more than its share of characters over the years, Barnes was in his own class. The 6-8 forward first became known when he played at Providence College, teaming up with DiGregorio. He was a physical force as a power forward with the Friars. If he hadn’t gotten hurt in the NCAA Tournament, Providence might have given UCLA at least a scare in the Final Four of 1973. Barnes signed with St. Louis of the ABA out of college, and had two good seasons there before the franchise went under. Barnes wasn’t a regular in Detroit, and he certainly had potential. His ABA success obviously gave him credibility with Brown. However, he carried some baggage. For example, in high school Barnes tried to rob a bus while wearing his high school varsity jacket with his name on it. In college, Barnes was charged with assault for hitting a Providence teammate, Larry Ketvirtis, with a tire iron. He pleaded guilty as part of a plea bargain. Barnes said later that he merely punched the teammate, but pled guilty so he could go on probation and turn pro. Barnes and tire irons seemed to go together in the public’s mind after that. Later, it was revealed that Barnes slowly was turning into a serious drug addict during the late 1970’s. He later admitted that he took cocaine while on the bench during his days with the Celtics. Barnes’ addition helped draw more than 15,000 fans to his first home game, a loss to Philadelphia. The Braves soon handed out posters of Barnes with the caption, "Buffalo is Marvin’s Garden," but it didn’t help him much. His stats were close to those of Shumate; the Braves needed the Barnes who tore up the ABA. In December, the Braves started losing games in bunches. The team went 3-10 in December, 3-9 in January and 3-10 in February. Barnes briefly skipped out on the team in an effort to renegotiate his contract, and was suspended immediately. He was gone for two weeks. Any hope for a playoff run was about dead. Along the way Brown added someone to share the losses, both fiscal and basketball. Rochester native Harry Mangurian bought a 50 percent interest in the team, although Brown still ran the show. Smith – on his way to playing the final 535 games in Braves’ history -- was about the only attraction left for the second half of the year. He qualified for the NBA All-Star Game and had the game of his life. Smith hit a 30-footer and a 40-footer (over Bill Walton) at the end of quarters, finished with 27 points, seven rebounds and six assists in 29 minutes. Smith was named the Most Valuable Player of the game. There was no doubt he belonged with basketball’s best now. "I wanted to win it, but I thought it was a little bit far-fetched since I wasn’t even starting," Smith said later. Knight averaged more than 20 points per game when he was in lineup, as a knee injury cut into his playing time. Nater was effective at center, and went on to lead the league in rebounding. Otherwise, the bodies kept coming as the Braves searched for any sort of answers. Among the players imported during the season were Larry McNeill, Mike Glenn, Gary Brokaw and Scott Lloyd. Bird Averitt even came back for a second act. Nothing worked. Attendance was sinking. The announced average for the season was 6,157, and that was probably inflated by giveaways. Even the weather seemed to work against Buffalo in its last two seasons, as Buffalo had two of its worst winters in history. Five games were postponed during those two seasons. As for Sonju, he says he spent a great deal of time putting out fires started by rumors. "I was not there when the team threatened to move to Miami," he said. "Those rumors would happen weekly. I remember coming to my office one day, and all of the press was there. You knew something had happened. Then I heard someone had said the team was moving to Louisville. Another day it was Miami. It got to be so bad that it bred insecurity for everyone. "I was committed to do everything humanly possible to make sure the team could not move. I had an obsession with it. It didn't happen." Sonju didn’t help matters when he was quoted in a story as saying he’d rather sellout a 9,000-seat arena in Dallas than sell 6,000 seats in Buffalo. While no one said the franchise was going to be moved at the end of the season, it sure felt that way in the final weeks and days. Buffalo’s last home victory came on March 17, as the Braves beat the Milwaukee Bucks, 136-127. The team lost its next 11 games, and beat Chicago on the road to set up the final weekend of the season. The last home game was on April 8, 1978, against New York. Bob McAdoo was there to help push his old team out the door, leading the Knicks with 31 points to a 118-107 win over Buffalo before 11,801. The next day, the Braves finished their season in Boston. The Celtics were in the midst of going 32-50, as the great teams of the 70’s finally had collapsed. John Havlicek had previously announced his retirement. It was fitting from a Buffalo standpoint that he go out against the Braves, and help beat them. After all, he had been a major reason why the Celtics had always beaten Buffalo during the Braves' eight-year history whenever it seemed to matter. Boston won the game, 131-114, and Havlicek had 29 points -- including 11 in a span of three minutes, nine seconds. Also playing the final game of his NBA career that day for Boston were Ernie DiGregorio and Dave Bing. Smith was kicked out of the game, while Nater scored the last Buffalo basket. The Braves finished 27-55, and seemed destined to be somewhere else by fall. But where? Sincere thanks for your Braves history series, Mr. Bailey. Outstanding work.